Lila Lapanja, shown competing in last year's U.S. Alpine Championships at Squaw Valley, earned the 2014 NorAm slalom title. Lila Lapanja, who grew up in Incline Village and raced for the Diamond Peak and Sugar Bowl ski teams, secured the NorAm slalom title with a podium finish in the final women’s race of that discipline at Canada Olympic Park last week. Resi Stiegler won the race and was followed by Canada’s Brittany Phelan and Lapanja. Independent skier Hailey Duke of the U.S. finished second in the slalom standings and will also have a guaranteed World Cup start next year along with Lapanja, who finished ninth in the 2012-2013 slalom standings. The 2014 Audi FIS Alpine World Cup season came to a close Sunday in Lenzerheide, Switzerland, where World Cup giant slalom champion Ted Ligety led the USA with a 12th-place finish in the slalom finale. 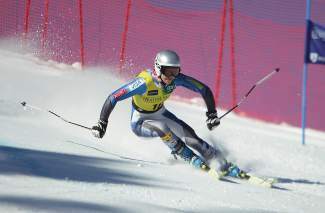 Ligety, who won the giant slalom on Saturday to secure his fifth career title in the event, finished his season fourth in the overall World Cup standings. Squaw Valley skier Travis Ganong, meanwhile, ended his best World Cup season to date, highlighted by several top-10 finishes, including a fifth place in the Olympic downhill in Sochi and a podium finish in Kvittjell, Norway. He finished ninth in the downhill standings, 19th in the super G and 23rd overall. American David Chodounsky finished Sunday’s slalom in 18th, etching him into 19th in the slalom standings for the season. Bode Miller did not finish his second run, but he still rounded out his season in eighth overall, eighth in the downhill and fifth in the super G standings. Olympic silver medalist Andrew Weibrecht finished 26th in the super G standings. Ultimately, the race and the day went to Austrian Marcel Hirscher, who claimed both the slalom title as well as the World Cup overall title. Hirscher took the slalom title from Felix Neureuther of Germany, who settled for second with Henrik Kristoffersen of Norway third. Hirscher also bested Aksel Lund Svindal of Norway and Alexis Pinturault of France, who earned second and third, respectively, in the overall. Olympic slalom champion Mikaela Shiffrin closed out her career-best season with a 12th-place finish in a foggy GS finale, one day after earning her second straight slalom title with a win in Lenzerheide. Anna Fenninger of Austria cut through the clouded, misty top section to seal the victory, which earned her the World Cup giant slalom title to put alongside the overall globe she won the previous day. Shiffrin, who turned 19 on Thursday, ended the season ranked sixth overall and seventh in GS. Olympic gold medalist Julia Mancuso of Squaw Valley did not race Sunday but finished her season ranked 15th in both the super G and downhill and 23rd in the overall. Truckee native Stacey Cook gained momentum throughout the season, tying Mancuso for 15th in the super G standings while finishing 18th in downhill and 28th overall. Leanne Smith also produced a solid year with 19th in super G and 30th in downhill. The American skiers will compete this week in the Nature Valley U.S. Alpine Championships at Squaw Valley.